Living authentically and autarchically, who wouldn’t want that? With her hypnosis book, the author would like to show how to reach this goal. It is important for her to present the historical and philosophical background and to make clear that hypnosis is not and must not be “charlatanism”. Hypnosis has a long tradition over many centuries, which is not “only” based on psychology. This is another reason why it deserves our attention. The objective of hypnosis is good communication bringing clarity between the human conscious and subconscious and this is an essential requirement for a healthy and happy, autonomous life. Lady Susan is british, she grew up in Northern Ireland. She is very well educated in medicine, psychology, philosophy, and religion science. Her four studies she did in Belfast, London, Marseilles and Barcelona. Moreover she is educated in naturopathic as for example homeopathic and acupuncture in Shanghai, Moskow and Germany. She came over to Germany working there in her own naturopathic practice. In the year of 2003 she founded the „Center of interactive Medicine“ in the South of Germany. 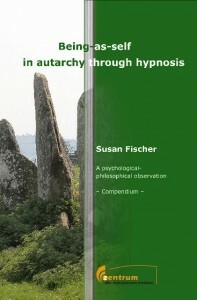 Furthermore she developed her own method to work with hypnosis. In the center she trains therapists using her so called „communicative hypnosis“ which also covers philosohical principles. She is an author and has her own series of CD´s in the german language „Geführte Trance von und mit Susan Fischer“ and the english CD „Guided Trance with Lady Susan“, -Your journey-.